It has now been a week since my latest haul, and I picked up so many products in need of a review. I've not used a lot of the products enough to do a review on them yet, but these two are the ones I've used most in the last week. Both products are by far beauty blogger favourites. 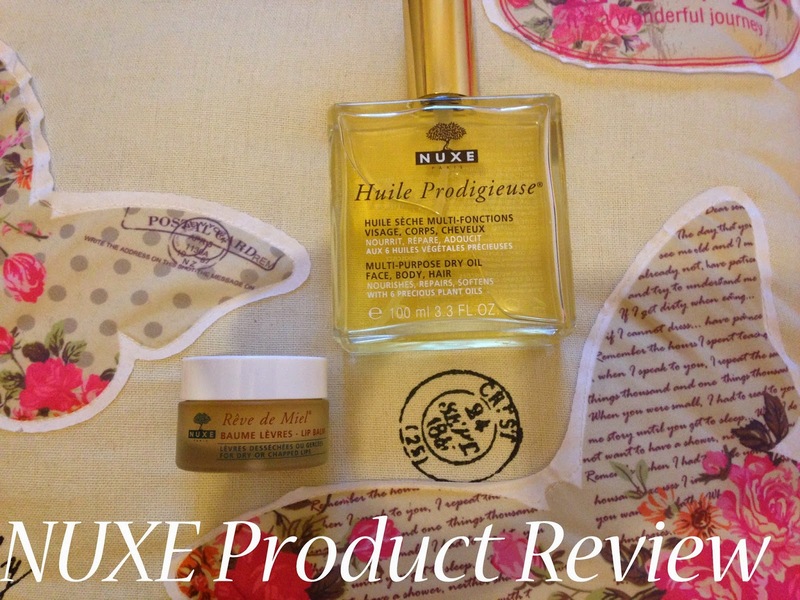 That's right, I'm talking about the NUXE Huile Prodigieuse and the coveted Rêve de Miel lip balm. I'm going to start with the Huile Prodigieuse Multi-Usage Dry Oil (£28). This wasn't a product that instantly jumped out at me after reading reviews, but I suddenly became obsessed with it, and the next day picked it up from the M&S Beauty Hall. It contains a combination of 6 precious oils: borage, St. John's Wort, sweet almond, camellia, hazelnut and macademia, as well as vitamin E. The oil is marketed for use on the body, face and the hair, and I can say that I do use it for all 3 purposes! My first thought for this product was "I'm too lazy for body lotion, this could be a miracle". And boy I was right. I apply this straight after a shower for silky smooth skin. One thing to note: don't use this if you have wooden floors like I do, the oil makes it really slippery underfoot. I prefer to put a towel down on the bed to lie on, and spritz from there for less mess. I find this is great if you're going for a night out, a spray down the front of the legs really adds a gorgeous shimmer, and it would also be amazing to accentuate a tan in the summer! You could also use the Huile Prodigieuse as a massage oil, with it's silky feel and sensual perfume. I also thought I could use this oil in place of a serum in my skincare routine. This I have found works really well. I spray 2-3 pumps into my hands and apply to my face and neck before moisturising. I thought this would make my skin super-oily, but I actually find my skin is less oily than normal if I have used this product! I only really use this in the night, so cannot comment on how well it fares under make-up, but it really makes my skin feel divinely soft! The final way I use Huile Prodigieuse is as a hair oil. I rub a pump in my hands and apply over the ends of my hair while it is still wet. While I haven't noticed any major effects using this product this way, I do find it seals the ends and adds a tad more moisture. One final thing, and my favourite thing about this product is the scent! It is laden with orange blossom, which so happens to be one of my favourite notes, and smells really pretty and comforting. It is elegant and clean, without being too overpowering, which is what you really need in a body product. I do find the scent akin to the Elie Saab fragrance, if a lighter version, and have even had a cheeky spritz of this when I want a top up of the scent. I also have a sample of the sister fragrance Prodigieux, but I've not quite gotten around to trying it yet. I'd definitely recommend the Huile Prodigieux as a great multi-tasker, and brilliant for a bit of extra moisture to the face, body and hair now that summer is upon us! Well I did not realise how long of a review that was going to be! I'll finish with a few words about the Rêve de Miel Lip Balm (£9.50) It has a velvety matte texture, which really adheres to your lips and lasts for so long! It hit me the other day when I applied it, ate, drank, and a few hours later it was still on my lips! Another point to make is that if you pop it on before bed, your lips still feel moisturised in the morning. I think the scent is to die for...honey, lemons, pure comfort! It actually really smells like the Lush Happy Hippy shower gel, which I also purchased in the same haul! I've been so impressed with my first purchases from NUXE and can't wait to try a few more products. I have a sample of their aftersun to try out, but some of their skincare items sound great too. Have you tried any NUXE products?